2Student Research Committee, Shiraz University of Medical Sciences, Shiraz, Iran. 4Professor of Nephrology, Nephrology-Urology Research Center, Shiraz University of Medical Sciences, Shiraz, Iran. Resident of Neurosurgery, Shiraz University of Medical Sciences; Neuroscience Research Center, Chamran Hospital, Chamran Avenue, Shiraz, Iran. Postal Code: 7194815644. Afshariani R, Farhadi P, Ghaffarpasand F, Roozbeh J. Effectiveness of Topical Curcumin for Treatment of Mastitis in Breastfeeding Women: A Randomized, Double-Blind, Placebo-Controlled Clinical Trial. Oman Med J 2014 Sep; 29(5):330-334. Objective: To determine the efficacy of topical curcumin in reducing breast inflammation in women suffering from lactational mastitis. Methods: A randomized double-blind, placebo-controlled study including 63 breastfeeding women with lactational mastitis were randomly assigned to receive curcumin topical cream, one pump every 8 hours for 3 days (n=32) or topical moisturizer as placebo (n=31). Using an index for severity of breast inflammation, all of the patients had moderate breast inflammation before entering the study. The outcome of treatment was evaluated using the same index at 24, 48 and 72 hours of starting the treatment. Results: There was no significant difference between two study groups regarding the baseline characteristics such as age (p=0.361) and duration of lactation (p=0.551). After 72-hour of therapy, patients in curcumin groups had significantly lower rate of moderate (p=0.019) and mild (p=0.002) mastitis. Patients in curcumin group had significantly lower scores for tension (p<0.001), erythema (p<0.001) and pain (p<0.001), after 72-hour of treatment. Conclusion: The results of the current study indicate that topical preparation of curcumin successfully decrease the markers of lactational mastitis such as pain, breast tension and erythema within 72 hours of administration without side effects. Thus, topical preparation of curcumin could be safely administered for those suffering from lactational mastitis after excluding infectious etiologies. Keywords: Lactational Mastitis; Puerperal Mastitis; Curcumin; Turmeric. Considering the documented anti-inflammatory effects of turmeric along with its minimal side effects,13,22 it is hypothesized that the use of such herbal medication may help in reducing the inflammation of breast tissue in patients suffering from mastitis. Therefore, this study aims to assess anti-inflammatory effects of curcumin in preparations for topical use comparing to placebo in patients with lactational mastitis. A randomized double-blind, placebo controlled clinical trial was performed in maternal care outpatient clinic of Hafez hospital, a tertiary mother and child healthcare center affiliated with Shiraz University of Medical Sciences, during a 1-year period from September 2012 to December 2013. The study protocol was approved by intuitional review board (IRB) of Shiraz University of Medical Sciences. The approval of the university medical ethics committee was also achieved before the study. All the participants provided their informed written consents before inclusion in the study. The trial was registered with the Iranian Clinical Trials Registry (IRCT2014051811375N4; www.irct.ir). A total number of 70 breastfeeding women between 21 and 35 years of age were referred to our clinics with impression of mastitis. As the term lactational mastitis is referred to a spectrum of clinical conditions ranging from mild breast inflammation to complicated infectious mastitis, an inflammation severity index was used to screen the patients for inclusion.23 Women who had at least two of the following criteria were considered to have lactational mastitis: breast erythema, increased breast tension not relieved by breastfeeding, pain in the breast, flu-like symptoms (including fever >39°C) and lumps in the breast tissue. Those with milk staphylococcal count higher than 104 CFU/ml, and a milk leukocyte count higher than 106 CFU/ml were excluded. Moreover, women with breast abscess, breast engorgement, breast filling, blocked duct and galactocelle were excluded because such conditions can mimic clinical features of mastitis. Individuals who had a previous history of mastitis, recent trauma to the affected breast, breast surgery, inflammatory skin diseases and recurrent mastitis were considered ineligible for the study. Mothers who had taken systemic antibiotics in the recent 2 months were also dropped. Both mild and sever cases were excluded. Individuals diagnosed with lactational mastitis were screened using the inflammation severity index which is reported as summation of three different scores (Erythema, Breast tension and Pain). The index is reported from 0 to 19. Values for the scales are represented in (Table 1). Patients who scored 8-14 were considered to have moderate breast inflammation and were enrolled in the study. Those with score less than 8 were considered to have mild inflammation and individuals with score over 14 had severe inflammation of breast. Table 1: The mastitis severity scale used for the measurements of mastitis signs and symptoms. Individuals in one group were treated with a topical curcumin cream as an anti-inflammatory agent (curcumin-treated group). The topical Curcumin Cream-200 mg per pump (Neurobiologix, Texas, USA) was administered according to the following method: patients were asked to apply one pump of the cream to the affected breast every 8 hours, course of treatment lasted 72 hours (3 days). 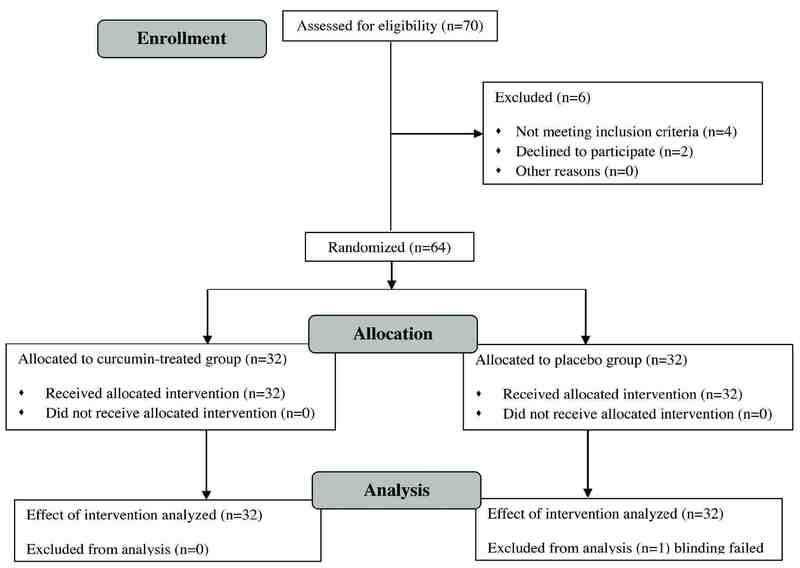 On the other group, individuals were administered a topical moisturizer cream as the placebo (placebo group) and the treatment course was similar to the curcumin-treated group. Moreover, prior to randomization, all of the patients had been taught for effective milk removal for 24 hours as the standard first line of treatment. In order to obtain the values for breast tension, pain and erythema all of the participants were evaluated clinically by one expert staff nurse before starting the treatment. After treatment was initiated, patients were re-evaluated by the same staff nurse 3 times with intervals of 24 hours in order to record changes of inflammation severity index. Sixty four breastfeeding women were randomized into two study groups using a computer-based random digit generator that is based on the registration number of the patients (the orders are referred). Study creams were allocated in separate packs blinded and labeled using a four-digit code. The information regarding which codes correspond to what treatment was maintained by the consulting statistician. Apart from the statistician, all of the staff including the nurse assigned and other coordinators was blinded to the treatment allocation. In order to have 90% power to detect significant differences between clinical healing rate of mastitis, 28 patients were required in each study group (p<0.05, two-sided). To compensate for possible none valuable patients and those who would possibly exit the study, we enrolled 70 participants. The Statistical Package for Social Science, SPSS for Windows, version 16.0 (SPSS Inc., Chicago, IL, USA) was used for data analysis. Paired t-tests were used to compare results within groups; independent t-tests were used to compare results between the groups; chi-square or Fisher’s exact tests were used to compare proportions and categorical variables. Repeated measure test was used to compare the trends in changes of tension, erythema and pain between two study groups. Data are reported as means ± SD. A two-sided p-value less than 0.05 was considered statistically significant. Out of the 70 patients assessed for eligibility, four did not meet the inclusion criteria and two individuals declined further participation. Thus, the final number of patients being randomized into two study groups was 64. Blinding failed for one of the patients allocated to receive and finally, 32 patients were enrolled in curcumin group while 31 individuals were enrolled in placebo group (Fig. 1). Figure 1: CONSORT 2010 flow diagram for this randomized, double-blind, placebo-controlled clinical trial of effectiveness of topical curcumin for treatment of mastitis in breastfeeding women. Table 2: Severity of mastitis in 63 patients with lactational mastitis being treated with curcumin or placebo after 72 hours. There was no significant difference between two study groups regarding the baseline characteristics such as age (29.56 ± 3.5 vs. 28.77 ± 3.26 years; p=0.361) and duration of lactation (3.22 ± 1.5 vs. 3.45 ± 1.56 months; p=0.551). Table 2 represents the changes in inflammation severity index of patients after the treatment course was finished (72 hours). In the curcumin group after 72 hours of treatment, 23 patients became free of mastitis, 8 patients with mild breast inflammation while only 1 individual maintained moderate breast inflammation. As soon as the treatment course was finished in the placebo group, 12 patients had been relieved of symptoms completely, 15 individuals had mild breast inflammation, while 4 mothers remained with moderate breast inflammation (Table 2). Table 3 compares the mean scores for tension, erythema and pain between two study groups. Comparing the mean scores of breast tension, pain and erythema gathered during the intervals of 24, 48 and 72 hours. After initiation of treatment in the curcumin group, results revealed the decreased score for breast tension that was greatly significant during the first 24 hours of treatment (p<0.001). Meanwhile, a significant reduction in the score for breast pain was detected during the second 24 hours of treatment (p<0.001) while erythema of the breast decreased significantly during the last 24 hours of treatment course (p=0.002). Patients in placebo group also experienced significant reduction in pain scores after 72 hours of therapy (p=0.043); however, patients in curcumin group had significantly lower scores for tension (p<0.001), erythema (p<0.001) and pain (p<0.001). Table 3: Changes in mean of each score during the course of treatment in the curcumin-treated group. As mentioned earlier, the pain caused by inflammation of the breast tissue in case of mastitis is quite frustrating for the individual experiencing it. Thus, an important part of the treatment would be to reduce the inflammation, because if not controlled, it can influence a woman’s decision to cease breastfeeding. The main reasons cited for discontinuance of breastfeeding is because of lactational problems; in which mastitis is a significant and common complication.24 It can contribute to early weaning in the first three weeks.25 As breastfeeding is considered the most important route of feeding newborn especially in developing countries,26 early detection and treatment of lactational mastitis is very importance. Conventionally, ibuprofen has been considered as the drug of choice for reducing pain and inflammation of breast in mastitis. Although only very small amounts of ibuprofen are excreted into breast milk and adverse events have not been reported in nursing infants, the drug still has significant cardiovascular, gastrointestinal, metabolic and CNS adverse effects for the mother.28 Compared to ibuprofen, therapeutic use of curcumin provides extremely good safety profile. To date, no studies in either animals20 or humans21 have discovered any toxicity associated with the use of curcumin,29,30 and it is clear that curcumin is not toxic even at very high doses. Therefore, curcumin could be a safe alternative choice for individuals who are not able to take NSAID agents. Although the results of our study indicate that curcumin usage is effective in controlling breast inflammation, its efficacy is not compared to routine non-steroidal anti-inflammatory agents. Moreover, systemic administration of curcumin may be associated with a better efficacy compared to its topical usage which remains to be the subject of further investigations. Overall, there were a number of limiting factors to our study which include small study population and the method of patient selection. It should also be mentioned that mastitis can be viewed as a continuum of disease, from non-infective inflammation of the breast to infection that may lead to abscess formation. Non-infectious mastitis and infectious mastitis are a part of this spectrum, which mainly diagnosed using breast milk cultures and bacterial colony counts of the breast milk. On the other hand, in RCT, Kvist J et al23 found potentially pathogenic bacteria, at high levels in breast milk of both healthy individuals and women with lactational mastitis. Interestingly in this study, increasing bacterial counts did not affect the clinical manifestation of mastitis. Thus, bacterial counts in breast milk may be of limited value in the decision to treat with antibiotics, and results from bacterial culture of breast milk may be difficult to interpret. These results suggest that division of mastitis into infective and non-infective forms may not be practically feasible. Therefore, the method of patient selection for our study was to include individuals with an inflammation severity index of 8 to 14. This could be another limiting factor because patients whose scores were under 8 or over 14 were diagnosed with lactational mastitis but were not included. The results of the current study indicate that topical preparation of curcumin successfully decrease the markers of lactational mastitis such as pain, breast tension and erythema within 72 hours of administration without side effects. Thus, topical preparation of curcumin could be safely administered to those suffering from lactational mastitis after excluding infectious etiologies. The authors would like to acknowledge all the patients and their families who patiently participated in the study. We would also like to thank the staff of the maternal health clinic of Hafez hospital who participated in data collection and follow-up. 1. Abou-Dakn M, Richardt A, Schaefer-Graf U, Wöckel A. Inflammatory Breast Diseases during Lactation: Milk Stasis, Puerperal Mastitis, Abscesses of the Breast, and Malignant Tumors - Current and Evidence-Based Strategies for Diagnosis and Therapy. Breast Care (Basel) 2010 Mar;5(1):33-37. 2. Jahanfar S, Ng CJ, Teng CL. Antibiotics for mastitis in breastfeeding women. Cochrane Database Syst Rev 2009;(1):CD005458. 3. Amin AL, Purdy AC, Mattingly JD, Kong AL, Termuhlen PM. Benign breast disease. Surg Clin North Am 2013 Apr;93(2):299-308. 4. Kasales CJ, Han B, Smith JS Jr, Chetlen AL, Kaneda HJ, Shereef S. Nonpuerperal mastitis and subareolar abscess of the breast. AJR Am J Roentgenol 2014 Feb;202(2):W133-9. 5. Kvist LJ. Toward a clarification of the concept of mastitis as used in empirical studies of breast inflammation during lactation. J Hum Lact 2010 Feb;26(1):53-59. 6. Barbosa-Cesnik C, Schwartz K, Foxman B. Lactation mastitis. JAMA 2003 Apr;289(13):1609-1612. 7. Foxman B, D’Arcy H, Gillespie B, Bobo JK, Schwartz K. Lactation mastitis: occurrence and medical management among 946 breastfeeding women in the United States. Am J Epidemiol 2002 Jan;155(2):103-114. 8. Tang L, Lee AH, Qiu L, Binns CW. Mastitis in Chinese breastfeeding mothers: a prospective cohort study. Breastfeed Med 2014 Jan-Feb;9(1):35-38. 9. Academy of Breastfeeding Medicine Protocol Committee. ABM clinical protocol #4: mastitis. Revision, May 2008. Breastfeed Med 2008 Sep;3(3):177-180. 10. Jitoe-Masuda A, Fujimoto A, Masuda T. Curcumin: from chemistry to chemistry-based functions. Curr Pharm Des 2013;19(11):2084-2092. 11. Aggarwal BB, Kumar A, Bharti AC. Anticancer potential of curcumin: preclinical and clinical studies. Anticancer Res 2003 Jan-Feb;23(1A):363-398. 12. Sreejayan, Rao MN. Nitric oxide scavenging by curcuminoids. J Pharm Pharmacol 1997 Jan;49(1):105-107. 13. Goel A, Kunnumakkara AB, Aggarwal BB. Curcumin as “Curecumin”: from kitchen to clinic. Biochem Pharmacol 2008 Feb;75(4):787-809. 14. Zang S, Liu T, Shi J, Qiao L. Curcumin: a promising agent targeting cancer stem cells. Anticancer Agents Med Chem 2014;14(6):787-792. Epub ahead of print. 15. Terlikowska K, Witkowska A, Terlikowski S. [Curcumin in chemoprevention of breast cancer]. Postepy Hig Med Dosw (Online) 2014;68(0):571-578. 16. Zorofchian Moghadamtousi S, Abdul Kadir H, Hassandarvish P, Tajik H, Abubakar S, Zandi K. A Review on Antibacterial, Antiviral, and Antifungal Activity of Curcumin. Biomed Res Int. 2014;2014:186864. 17. Prakash P, Misra A, Surin WR, Jain M, Bhatta RS, Pal R, et al. Anti-platelet effects of Curcuma oil in experimental models of myocardial ischemia-reperfusion and thrombosis. Thromb Res 2011 Feb;127(2):111-118. 18. Tanwar V, Sachdeva J, Golechha M, Kumari S, Arya DS. Curcumin protects rat myocardium against isoproterenol-induced ischemic injury: attenuation of ventricular dysfunction through increased expression of Hsp27 along with strengthening antioxidant defense system. J Cardiovasc Pharmacol 2010 Apr;55(4):377-384. 19. Chandran B, Goel A. A randomized, pilot study to assess the efficacy and safety of curcumin in patients with active rheumatoid arthritis. Phytother Res 2012 Nov;26(11):1719-1725. 20. Reid JM, Buhrow SA, Gilbert JA, Jia L, Shoji M, Snyder JP, et al. Mouse pharmacokinetics and metabolism of the curcumin analog, 4-piperidinone,3,5-bis[(2-fluorophenyl)methylene]-acetate(3E,5E) (EF-24; NSC 716993). Cancer Chemother Pharmacol 2014 Jun;73(6):1137-1146. 21. Lao CD, Ruffin MT IV, Normolle D, Heath DD, Murray SI, Bailey JM, et al. Dose escalation of a curcuminoid formulation. BMC Complement Altern Med 2006;6:10. 22. Al-Kashmiri A, Al-Mutani M, A-Zadjali A. Complications of Hot Tumeric Use in Acute Trauma. OMJ [Online] 2010 July; 25(3). 23. Kvist LJ, Larsson BW, Hall-Lord ML, Steen A, Schalén C. The role of bacteria in lactational mastitis and some considerations of the use of antibiotic treatment. Int Breastfeed J 2008;3:6. 24. Dener C, Inan A. Breast abscesses in lactating women. World J Surg 2003 Feb;27(2):130-133. 25. Schwartz K, D’Arcy HJ, Gillespie B, Bobo J, Longeway M, Foxman B. Factors associated with weaning in the first 3 months postpartum. J Fam Pract 2002 May;51(5):439-444. 26. Veghari G, Mansourian A, Abdollahi A. Breastfeeding status and some related factors in northern iran. Oman Med J 2011 Sep;26(5):342-348. 27. Kuttan R, Sudheeran PC, Josph CD. Turmeric and curcumin as topical agents in cancer therapy. Tumori 1987 Feb;73(1):29-31. 28. Bushra R, Aslam N. An overview of clinical pharmacology of Ibuprofen. Oman Med J 2010 Jul;25(3):155-1661. 29. White B, Judkins DZ. Clinical Inquiry. Does turmeric relieve inflammatory conditions? J Fam Pract 2011 Mar;60(3):155-156. 30. Alappat L, Awad AB. Curcumin and obesity: evidence and mechanisms. Nutr Rev 2010 Dec;68(12):729-738.